I used this Sage & Bay Salt to dry brine my turkey last Christmas and it tasted AMAZING. That being said, I wondered how it would taste on regular chicken. I just had to give it a try, right? So I did! It's a little time consuming to prep but on the day you actually get to eat it, it's a breeze to roast. I felt like being lazy, so I just threw in some potatoes and veg and called it a day. One pot meals are awesome, aren't they? Rinse chicken well and pat dry with paper towels. Rub sage & bay salt all over chicken, depositing more on the thicker parts, like the breast and thighs. Sprinkle and rub a little inside the cavity of the chicken. Place in a large ziplock bag and seal while pressing out as much of the air out of the bag as possible. Marinade for 2 days in the fridge, turning and massaging the chicken once or twice each day. Rinse the dry brine off of chicken and pat dry. Let stand at room temperature 30 minutes prior to roasting. Pile veggies and potatoes in the middle of a roasting pan or casserole dish. Season potatoes and veggies with salt and pepper. Drizzle with olive oil and give it a good toss to get everything lightly oiled up. Set aside a handful of veggies. Place chicken breast side up on top of the veggies in the roasting pan. Loosely stuff reserved veggies inside the cavity. Tuck the wing behind the breasts so that they don't burn while roasting. 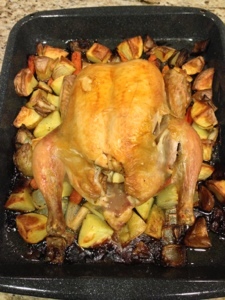 Place roasting pan into the preheated oven and roast chicken for 20 minutes. Take roasting pan out and cover loosely with aluminum foil to let chicken rest for 10-15 minutes. Separate the chicken meat from the bones. Cut meat into bite/manageable sizes. 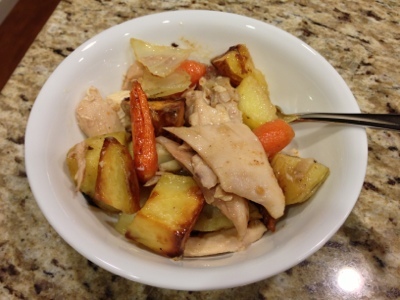 Mix with veggies and drippings and serve family style. Enjoy! Oh MAN. I'm never roasting chicken any other way - well maybe with a different brine rub just for funsies. Lol. You can pour half a cup of water (or chicken stock) on the bottom of the pan before you put it into the oven if you want. That way the veggies at the edge won't burn. Although some of the crispy onion pieces tasted glorious - like onion rings without the batter. If you're health conscious, you can remove some of the fat from the chicken drippings before mixing everything together to serve. Depending on how fat your chicken is, it can get pretty oily. I suspect a Free Range chicken would be less oily, but not as tender, obviously.